Lauren Scharhag: Book III is here! The day has arrived! Where Flap the Tatters of the King is now available on Amazon and Smashwords. Let me remind you, you can check out excerpts here and here. What're you waiting for? Go buy a copy. Be sure to leave a review. And if you haven't experienced the world of the Order yet, Book I is free on Smashwords. Book III sees the surviving members of the Order – Kate, JD, Murphy, Bill, Clayton and Alyssa – reunited in a world known as Corbenic. It’s definitely not a warm reunion. With the Corbenese king held hostage by Starry Wisdom, the land has been plunged into endless winter, and certain members of the team are less than thrilled that they have been joined by former MJ-12 Agent Emily Hayes. As the team sets out, the find themselves once again braving the elements, on their way to Corbenic's capital city, where they will be plunged into a world that has almost as many enemies within as without. It is a dark and seductive world, a world of alchemists and geomancers, nobles and courtesans. Unrest has spread throughout the empire, stirring talk of rebellion. And beneath all the gilt and glamor, evil sleeps. It is here that the team begins to find answers about themselves and about Starry Wisdom’s secrets. Both sides find themselves embroiled in a game of old alliances and older enemies. 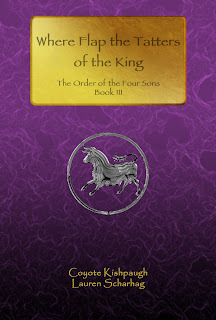 At all costs, the Order of the Four Sons must liberate Corbenic and restore their king. And the final war has yet to be fought.